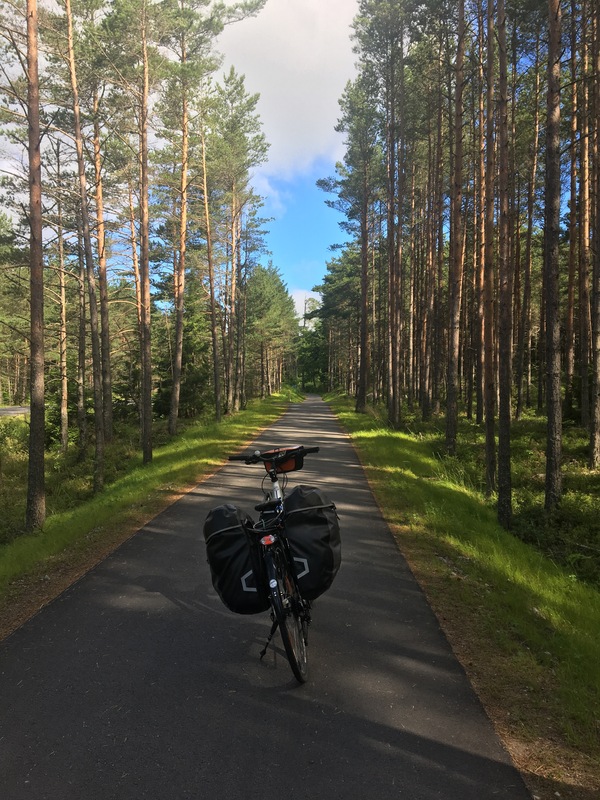 Yesterday I posted a bit of a summary about the 7 day bike trip I did last week from Riga to Tallinn, in Latvia/Estonia. Sam also posted my updates from every day on the trip as I did it. Today I wanted to just capture a few practical aspects of doing a self-guided, pre-planned trip on your own, based on my experiences and the way I personally like to travel. 1. Decide if you want to bring your bike or rent one. I don’t have the perfect bike for touring, so I have always rented. This takes care of the “what to do with the bike after you’re done riding” question, but also means you’re on a bit of an unknown quantity. I alleviate some of that by bringing my own seat, pedal and helmet. 2. Decide if you are willing to camp or not. Camping gives you more options for sleeping, but of course is its own logistical ball of worms. I’ve done it, but not alone. If you aren’t going to camp, consider booking accommodations in advance, especially in rural or busy areas. I had the company I rented the bike from book my accommodation, and I was very glad of it — there were at least two nights I wouldn’t have had a place to stay, otherwise. And even in places where there are more options, I personally don’t love arriving in a place at 3 or 4 in the afternoon and beginning the search for a place to sleep. 3. Get comfortable with basic bike mechanics. I am not great at bike repair, and that’s been one of the biggest reasons I have limited my cycle touring in the past. I did a fantastic one day hands on tutorial back in April, and I felt so much more relaxed because of it. I also brought my own tools. I didn’t end up having to use any of my knowledge except to slightly adjust my gear cable but I felt much better knowing I COULD if I had to. (I also did a wilderness first aid course, and ended up helping a woman in the airport who fell and hurt herself as I left). So yeah, prepared! 5. Seriously think through what you want to carry with you. I had more than I really wanted, especially shoes, because I had another week in Tallinn and St. Petersburg at the end of the trip. I also had a super heavy lock they gave me with the bike, and wished I’d brought my own lighter lock instead especially since I was in rural areas and almost every hotel had a place to leave my bike inside. I was too compliant to refuse this one when I got the bike, but wish I had — I also lost the only key, so it was a useless piece of heavy hardware in the end. I also chose to travel without any camera except my phone for the first time in 10 years, and it was freeing. 6. Assume it will be cold, and be pleasantly surprised. For someone who travels a lot, I have a weird inability to predict what clothes I’ll want when I’m packing. Layers are my friend. I start with cycling jerseys and shorts and work around that. This time I also had a tank jersey with a built in bra, a winter running shirt, a cycling waterproof coat, a wind jacket and a quilted vest. I wore every layer but the tank at various points. 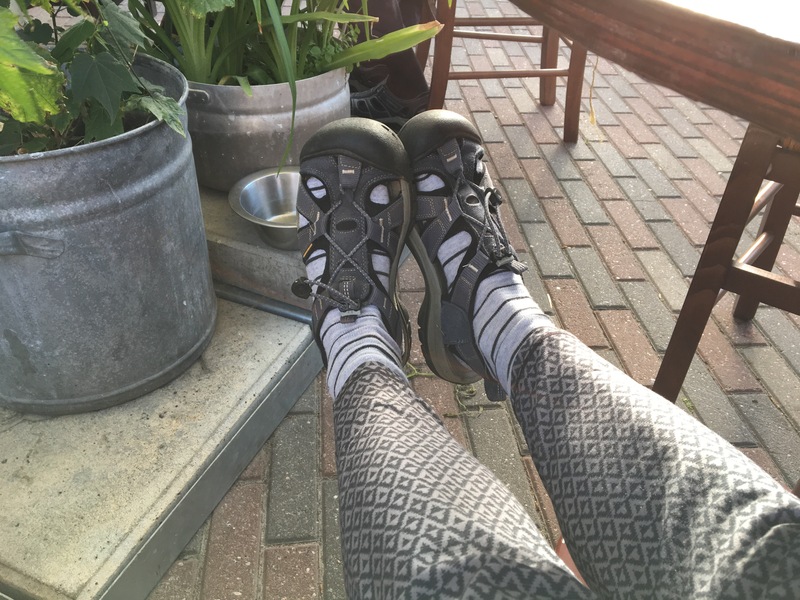 I also had a pair of soft pyjama-like yoga pants and my trusty keens sandals for off the bike and these have become my new traveling uniform. 7. Have access to data. I use the “roam like home” feature on my phone that gives me access to my home data plan while I’m in Europe or Asia for $10/day. This is invaluable to me for staying connected to people when I’m traveling alone and more important, for google maps. Which I needed almost every day at least once, especially to find hotels in cities. 9. Let go of pre-conceived notions of speed. When I’m on my road bike, I average about 25 km/hour, more on a good day. A lot of the time with the weighted cross bike in a headwind, I was looking at something like 13 to 15 km/hour. This can play head games with me and I feel like I’m falling behind or push myself too hard. I needed the computer to be able to roughly match up distance with maps, but I stopped paying attention to anything but indicators of how far I was in my day’s journey. 10. Clipping in helps. I’ve documented many times before how I’ve stupidly tried to use my road bike cleats on tours (spoiler alert: they don’t work for rough terrain when you need to be able to pedal unclipped sometimes), and I finally invested in a not-pricey pair of mountain biking shoes with spd clips. I have two sets of spd pedals that flip to flat sides, and I tested out both before I left. I had some anxiety about clipping in with a loaded bike, and I find spds harder to scoot in and out of than my cleats, but they worked great. On the third day, I lost a screw out of one of the spds, and happened to be in one of the only towns where I could replace them. I liked the new ones so much better that I replaced the other one as well. I was very grateful for the way the weight transfers with clipped in shoes, especially in the wind. Finally — and I can’t stress this enough — cheese sandwiches are your friend. Most of the places I was cycling, there was literally no place for lunch and rarely a food store. Most breakfasts were continental style, so I got in the habit of making a cheese sandwich on the EXCELLENT (I cannot stress enough how excellent) Baltic bread every day, and eating this at about the 30 km point in my ride, with dried apricots I’d brought from home. The food on my trip was fantastic, but lunch was not reliably available. I also brought some powerbar type snack thingies but something that felt like a real “lunch” was an important motivator for me. So that’s my survival guide… what things do you find most helpful when cycle touring? Thanks, Cate. These are great tips (though I am unlikely ever to do this). 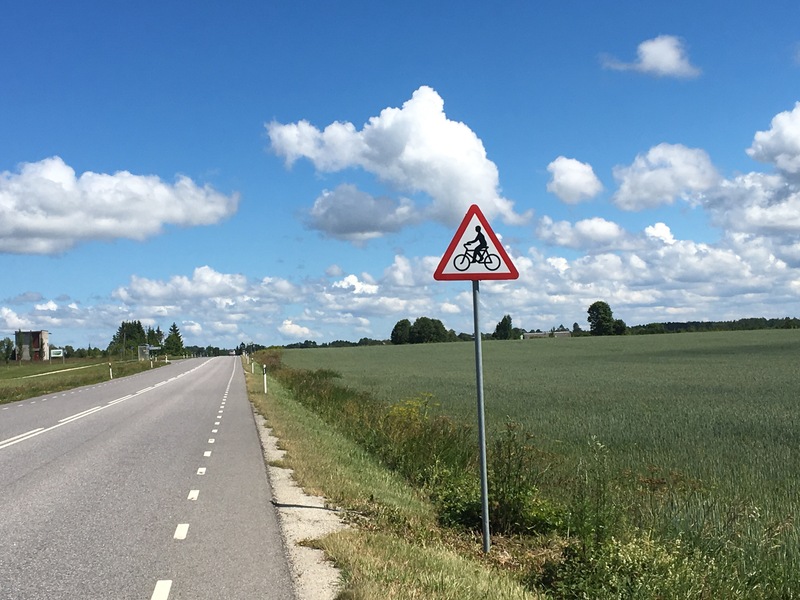 Your cycling tour in the Baltics has been one of the highlights of MY summer so far. What great daily updates. Thank you so much. Thanks Tracy! Am home now and need to figure out how to adjust to less active days! I’m still on my 3 month plan as I go European summer trip. I would add maps.me for offline maps (sometimes there is no mobile data coverage even with roaming and it in knows the bike tracks better). I have had great success booking accommodation one day ahead with booking.com or the IHA website. Sometimes that moves my endpoint a little bit but with the distance time scale I have that’s fine. For the trip I was on, there were some places with only one place to stay within 50 km, so I was glad to pre-book accommodations — but I like the flexibility of day-before booking. I get spooked by memories of driving cross country and having no place at all to stay in Winnipeg trying to book the day before because of a conference — it’s one thing to drive an extra 40km ;-). Thanks for the reminder of offline maps! The length of the bike trip, availability of a bike that will fit me (I’m only 5’1″) and weighing the cost of the bike if by bus, train or plane, will drive my decision on whether or not I will rent. Generally speaking on foreign trips or long multi-day or multi-wk. long trips where I am cycling with my own pannier loads, then best for me to bear cost of shipping and having my own bike since I’m petite. (I was a little intimidated when in Copenhagen, Denmark and looking at parked bikes all over the place. Majority for adult bikes: too big.) Same for Germany. Ssafety and endurance is much improved if on my own bike. Yes, you can bike tour on a folding bike with 16 inch wheels. It’s a Dahon. You can fold the bike and if in its bag, it comes on as baggage if the train doesn’t have a bike car. 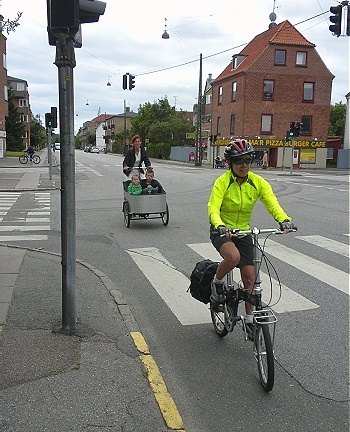 I did use front and back panniers….4 panniers. It was a 4 wk. trip in Europe. Last year, I only used 2 back panniers for a 2.5 wk. European trip where our cycling time was 50% less. I’m just a shade over 5.1 and have learned which commonly available rental bikes fit me — they usually have a lower slung frame than I’m used to at home, so it takes a little bit to adjust to it but after half a day it’s fine. It all depends on what I also want to do on a trip and if a bike will get in the way ;-).